At IFA Berlin 2017, Fisher & Paykel previewed two new premium refrigeration products to European retailers. Designed in New Zealand, Fisher & Paykel is a global appliance company that has pioneered innovations and delivered award-winning designs that have changed the way people live. Fisher & Paykel’s Chief Executive Stuart Broadhurst said: “Kitchens have become increasingly sophisticated with bespoke cabinetry, high quality materials and tighter gap control, so it makes sense for appliances to become better integrated as well. “Our new Integrated Column Refrigerator series is a matching set of individual fridges and freezers that are designed to be fully integrated, fitting flush into cabinetry and with the flexibility to be installed separately or grouped together,” continued Broadhurst. The Column series comes panel-ready with a choice of stainless steel panel or can be fully customised with your own bespoke panels. Customers can choose from a selection of widths to accommodate food storage needs and kitchen layouts. Column refrigerators and freezers offer a new level of food care with Fisher & Paykel’s new variable temperature zone feature. The temperature can be adjusted via a central control panel allowing different temperature modes within the same column. For example, a fridge column could operate a wine mode (7-15°C) or pantry mode (12°C), and a freezer column could be at soft freeze (-7°C) and deep freeze (-25°C). Also on show at IFA Berlin was Fisher & Paykel’s new Quad Door refrigerator, which it claims to be the first free standing unit featuring the variable temperature zone. Multiple temperature modes – Fridge, Chill, Soft Freeze or Freezer are all available in one compartment, adjustable at the touch of a button. 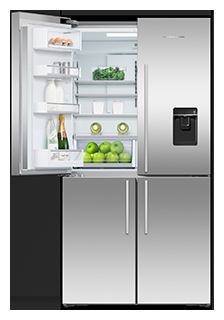 Both the Integrated Column Refrigerators and Quad Door Refrigerator are supported with Fisher & Paykel’s ActiveSmart Foodcare technology. ActiveSmart Foodcare controls how the refrigerator operates based on changing patterns of use and through continuous feedback, adjusts to the way the appliance is used. Its ability to respond to daily use means that it only uses the energy needed to help keep food fresher for longer.